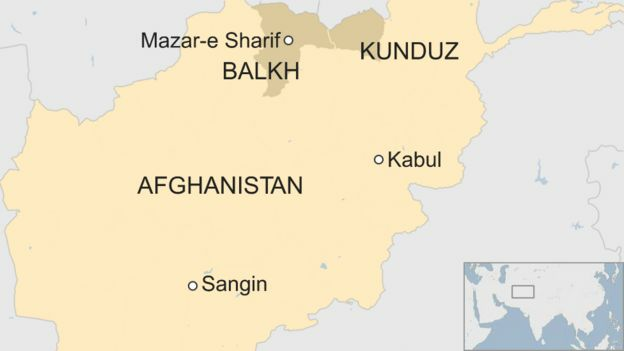 At least 50 Afghan soldiers have been killed in an attack by Taliban insurgents on a military base in northern Balkh province, military officials say. Reports say the number of casualties is far higher than the eight deaths initially reported. The military say that Friday’s attack took place near a mosque at the base, located in the city of Mazar-e-Sharif. The Taliban said in a statement that they launched the attack. The Taliban fighters wore army uniforms and drove through military checkpoints before launching the raid, a military spokesman said. An army commander told the AFP news agency that gunfire at the base could still be heard late on Friday and at least one of several attackers had blown himself up. US military spokesman John Thomas told Reuters that Friday’s attack was a “significant” strike, probably involving more than 50 casualties. He said the attack was centred around a mosque and a dining area of the camp. The base at Mazar-e-Sharif is home to the Afghan National Army’s 209th Corps, responsible for providing security to most of northern Afghanistan, including Kunduz province – which has seen heavy recent fighting. Last month about 50 people were reported to have died when militants believed to be from the group known as Islamic State targeted patients and staff at a military hospital in Kabul with guns, grenades and knives.